Many have heard the stirring Christian hymn entitled Amazing Grace. (To hear a musical rendition, click here.) This page presents the words of this song, as well as a brief biography of its composer — John Newton, a slave driver, who during a storm at sea came to a dramatic awakening and from there on devoted his life to serving God and fighting for the abolishment of slavery. Born in London in 1725 as the son of a commander of a merchant ship which sailed the Mediterranean, John also became a seafarer. Ultimately he became the captain of his own slave-trading ship. Although his mother, who had died early in his life, taught him about God, in his adult life, he abandoned all that he learned. However, on one homeward voyage, while trying to steer the ship through a violent storm, he experienced what he would later call “great deliverance.” When all seemed lost and the ship was about to sink, John exclaimed, “Lord, have mercy upon us.” As he subsequently reflected on what he had said, he began to believe that God had addressed him through the storm. For the rest of his life he observed the anniversary of May 10, 1748 as the day of his conversion, a day of humiliation in which he subjected his will to a Higher Power. In 1750 he married Mary Catlett, with whom he had been in love for many years. By 1755, after a serious illness, he had given up seafaring forever. During his days as a sailor he had begun to educate himself, teaching himself Latin, among other subjects. 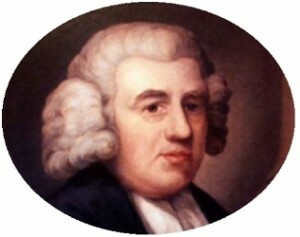 Later he met George Whitefield, a deacon in the Church of England, evangelistic preacher, and leader of the Calvinistic Methodist Church, and became his disciple. He also met and came to admire John Wesley, the founder of Methodism. He continued studying and learned Greek and Hebrew. Newton decided to become a minister and eventually was ordained by the Bishop of Lincoln and accepted the curacy of Olney, Buckinghamshire. Many flocked to his church. He also travelled to preach in other parts of the country. In 1767, the poet William Cowper settled at Olney and became Newton’s friend. Cowper helped Newton with his religious services and on his tours. Besides regular weekly church services, they began weekly prayer meetings with the goal of writing a new hymn for each one. They collaborated on several editions of Olney Hymns, which enjoyed great popularity. The first edition, published in 1779, contained 68 works by Cowper and 280 by Newton – including “Amazing Grace”, then by a different title. In 1780 Newton became the rector of St. Mary, Woolnoth, in London. There he again influenced many, including William Wilberforce, who later became a leader in the campaign for the abolition of slavery. Newton preached until the last year of his life, by which time he was blind. He died in 1807, secure in his faith that amazing grace would lead him home. the Gospel which he had long laboured to destroy. And twenty eight years in this Church. Another similar, but different, perspective on divine grace is found here.